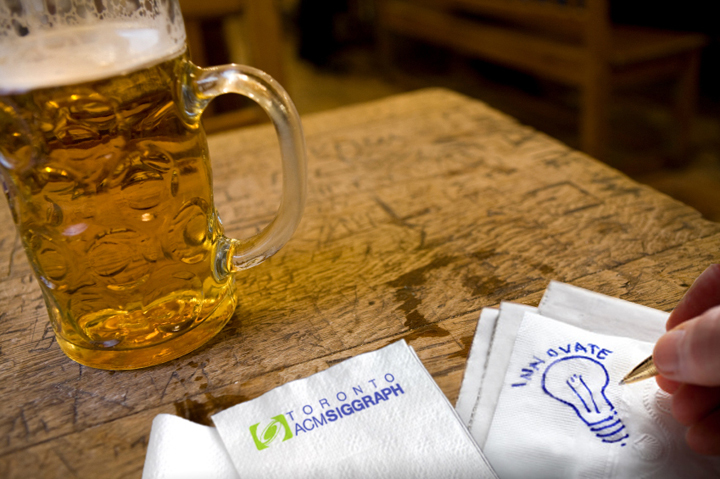 Come Join the Toronto ACM SIGGRAPH Chapter for one of our Pub and Portfolio Nights at the Monarch Tavern. Many talented artists came out to show off their work and mingle with industry professionals, as well as celebrate a great computer graphics community. The talent ranges from all levels, presenting their work in an informal and open setting. Laptops are scattered on numerous pub tables. Their light illuminating member faces, watching each demo reel and presentation alike. Resumes are reviewed, and business cards exchanged amongst industry experts. There is plenty of laugher and drinks to go around. This is a good chance to come out and mingle with us and other industry professionals. It’s always a great time personally and professionally. Please stay tuned for our next gathering and the Monarch Tavern.